This Victorian trade card, advertising Eureka Silk Thread, shows a sea serpent being caught with Eureka Silk Thread. Why would Eureka choose to use a sea serpent to advertise their sewing thread? A clue may lie in the undeniable draw or curiosity towards history’s unknown. What better way to get customers to notice their sewing thread. A recent WTSP news story about a sea serpent swimming in a Florida canal says a retired engineer has recorded pictures of a mysterious 20-foot long creature that’s been swimming in the canal behind his house. I thought to myself, ya right. After reading the story, I still don’t believe it. Here’s the news story if you’d like to read it for yourself. Do Sea Serpents Really Exist? I don’t know if sea serpents really exist, but it is possible. Scientists have discovered 52 new plant and animal species in the rainforest of Borneo Island since 2005. If these species can remain undetected for this long, why can’t a sea serpent remain undetected since pre-historic times? However, I’d need more definitive proof than pictures shot by a retired engineer in Florida to believe sea serpents exist. You can read Mysterious Sea Serpents, Parts 1-4: The Search Continues to learn more about these mysterious creatures. 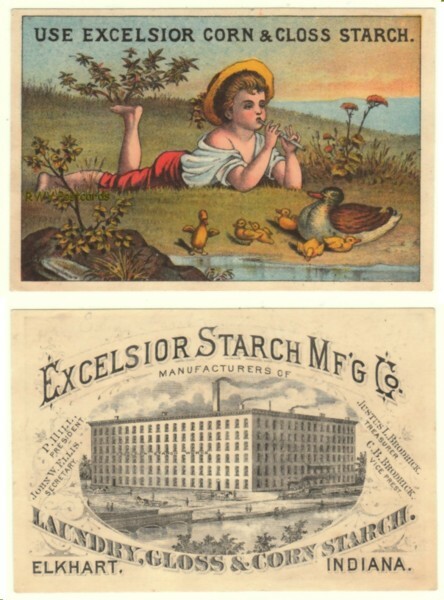 More Victorian trade cards with great graphics and color, can be found in my store. If you liked this blog post, please click the bookmark button to the right. I originally posted this on Remember When Vintage Postcard’s page on facebook back in June, under the notes tab. With the holiday season fast approaching, I thought my blog’s readers, who’ve never visited my store’s facebook page, might enjoy it. 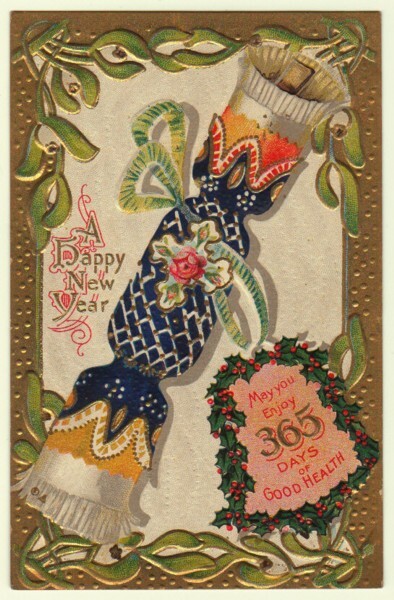 I no longer post on that tab as I now have this postcard and Victorian trade card blog. However, there are several posts on it my blog readers might find enjoyable. Feel free to visit it. Happy reading! The cracker was a British novelty invented by Tom Smith in 1847. It was a small, brightly coloured paper covered cardboard tube, twisted at the ends. When pulled, it created a small explosion or “pop”. Out tumbled a hand made paper hat, or small gift, and a motto or joke. The crackle or pop added excitement to Tom’s novelty, initially called a “bon bon”. More wonderful new year postcards, perfect for displaying this holiday season, can be found in my store- Remember When Vintage Postcards. ** If you liked this blog post, please click the bookmark button to the right. Collecting Santa Claus postcards has been and still is sooo enjoyable for me. These days, I look for an unusual feature in the antique or vintage postcard with him on it. The postcard to the right isn’t from my personal postcard collection (alas, bills beckoned), but illustrates what one could look for when building an outstanding collection. It shows a blue suited Santa Claus smoking, plus wearing checkered boots. In over 33 years of collecting Santa Claus’, I’ve never seen him wearing checkered boots. Note, the Santa Claus on my store’s home page is holding a switch. It is from my personal collection and a favorite. I also have a midgit Santa Claus postcard, but that is for another blog post. ** If you liked this blog post, please click the bookmark link to the right. It’s that time of year; the preparation for the annual food feast. Can’t wait to eat mandarin orange salad, Mom’s bread and celery stuffing, corn soufflé, green been casserole, jellied cranberries, sweet potatoes with marshmallows, my sister’s pretzel jello desert, and of course mashed potatoes, gravy, and turkey (did I forget anything??). In case you haven’t guessed, I’m hungry. I’m an antique and vintage postcard, and Victorian trade cards dealer, so will share a vintage recipe from my Grandma’s 1957 Sunbeam Mixmaster instruction booklet. Yes, I still use this vintage appliance. Set oven at 450 degrees F to preheat. Beat eggs in large Mixmaster bowl on No. 12 speed 1/2 min. Stop Mixer, add remaining ingredients. Beat on No. 4 speed until blended — about 1 1/2 min., scraping bowl. Pour into deep unbaked 9″ pie shell which has been chilled. Bake 450 degrees F 10 min. then 350 degrees F for 45 min. or until silver knife inserted in center comes out clean. Serve slightly warm with whipped cream. Sprinkle with chopped pecans, if desired. Pecan Topping: For an extra treat — melt 2 tbsp. butter and 1 tbsp. brown sugar. Add 3/4 cup finely chopped pecans, 1/4 tsp. vanilla. Spread over pie about 20 min. before baking time is up. The first pumpkin pie was served on the American’s side of the Atlantic in 1654. I’ve got this puzzle novelty Victorian trade card for sale, and decided maybe I should include its solution in the description. However, with slight embarrassment, I admit to being able to solve only parts of it. I am asking my blog readers for help. The pictures represent words. To solve this puzzle, put them together to form a phrase connected to the Standard Rotary Shuttle sewing Machine. Go ahead, have some fun solving it. I will be very grateful. For those who wish to solve this puzzle on their own, don’t read the comments. Or maybe I should leave the solution out of the description? You can find more great victorian trade cards with great advertising and graphics in my store. ** If you liked this blog post, please click on the bookmark button to the right.